Danny Trevathan #59 of the Chicago Bears lays on the field after suffering an apparent knee injury in the 4th quarter against the Tennessee Titans at Soldier Field on November 27, 2016 in Chicago. 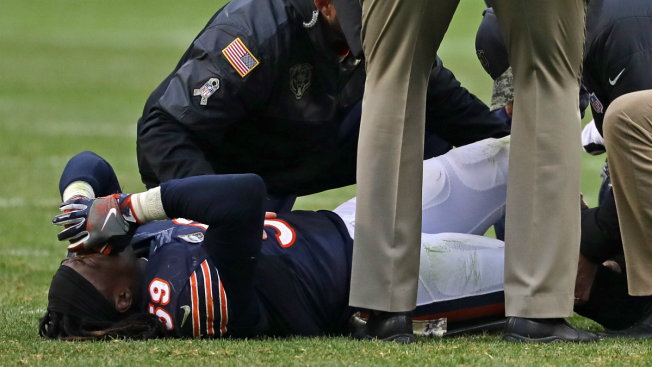 Chicago Bears linebacker Danny Trevathan was expected to be the crown jewel of the team's offseason acquisitions, but all of those hopes have been dashed after the injury he suffered in Sunday's loss to the Tennessee Titans. Trevathan, who left the game late in the fourth quarter after suffering an injury along the sidelines, has been diagnosed with a ruptured patellar tendon in his right knee, according to Bears head coach John Fox. That injury is a serious one and will require Trevathan to be placed on season-ending injured reserve. The Bears have been dealing with a slew of injuries in recent weeks, with quarterback Jay Cutler dealing with a serious shoulder injury and right guard Kyle Long lost for the season with ankle and shoulder injuries. In Trevathan's case, the timing could hardly have been worse for him to suffer such a catastrophic injury. The Bears are already without their other star inside linebacker, as Jerrell Freeman is currently serving a four-game suspension for performance enhancing drugs.